Do you think a good Golf ﻿G﻿PS Watch can enhance your game? If you think it can, you need to know what are the important features of such watches and how golfers stand to benefit by using these watches. Golf GPS Watches are the latest technological innovations which have entered the golf course. They are aimed at simplifying and providing the players a convenient and easy golfing experience with a stylish and sophisticated element. These GPS watches are basically devices that allow the players to measure the field and enable them to map out the course which they are playing on. They are designed to tell distances and give accurate directions. The best part of all is they are also designed to keep a track of your scores. Previously golfers used to have a tough time mapping the course as they had to refer to books, maps as well as markers to prepare for a game of golf on a new course. This latest range of Golf GPS watches is the newest breed of devices which will now allow faster and efficient games. They will help in cutting down time in long hours spent in researching the course and provide the same data at your fingertips just at the touch of a few buttons. These Golf GPS Watches will prove to be a big help especially for amateur golfers who need all the support they can get to improve their game. Though there are many such watches that have taken the entire market by storm, only a few need a special mention because of the special and useful features they have. These watches will help both amateurs as well as the professionals in several ways, mostly in planning their game, making decisions and in tracking scores. Initially, when these watches entered the market, they were priced exorbitantly, but the good news now is that the prices have dropped considerably making them more affordable and within the reach of almost all players who are passionate about using strategies, techniques, and devices to improve their game. To help you understand more about the watches and help you choose one that suits your needs the most. Here is a comparison table of the top 10 Golf GPS watches that I have shortlisted, from which you can take your pick and buy one right away. Keeping in view the requirement to know all the salient features of these watches at a quick glance, check out this comparative table which will enable you to have a look at the top 10 trending Golf GPS watches as well as know about their significant features before you actually take the plunge and invest in your latest golf accessory. The products that have been reviewed for your convenience and perusal are some of the best and most popular Golf GPS watches that are trending the markets this year. These are the top 10 picks which have become the favorite of quite a few seasoned players as well as the amateurs who are finding them great devices which are helping them improve their game to a large extent. The Scoreband Golf GPS Watch is a stylish and sturdy looking watch which is going be your best friend on the golf course as it has a host of features which is going to help you by giving you a whole lot of inputs on the field. This watch is great to look at and has a larger design as compared to other watches. It is also more ergonomic, Otherwise. it has quite a simplistic appearance with a very comfortable wristband that is durable too. The setup of the watch is also very simple. After powering the watch, you just need to click on the mode button to check your score. There are 30,000 pre-installed courses which you can select either manually or automatically. The loading begins as soon as you start on the first hole. Scores are saved automatically after every round of the game and you can review up to 10 games at one go. This feature is very beneficial to budding golfers who would like to check on how much their game has improved over the last few sessions. The most important feature of any GPS watch is first and foremost its performance, The next feature that is important is the ease of use. The ScoreBand Golf GPS watch has both these features. The watch also features a satellite link-up that allows the watch to locate and load the required data at a much faster pace as compared to other similar GPS watches available in the market. It has an excellent battery life and can be used easily for 3-4 rounds before it needs to be charged. One of the most popular brands Bushnell has many loyal users. who never cease to rave about their products. The Bushnell Neo Ion Golf GPS Watch is very popular for two reasons. the first its excellent battery life and second is its ease of use. 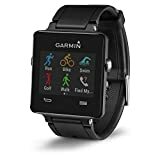 The GPS watch has excellent features which include 35,000 pre-loaded courses which are spread across the globe spanning more than 30 countries. The efficient performance of its battery can last for 3-4 rounds before you may need to charge it again. Even when the watch is not in use the battery can last for up to a period of 2 years without getting discharged. Another important and significant feature of this watch is the short distance calculator. This feature can easily tell you the distance of how far you have hit your shot. The auto-off setting feature is a feature which allows you to set a maximum time for your round, after which the GPS automatically switches off to conserve its battery life. A clear LCD display on the sleek looking watch makes viewing the data very easy. The center yardage displays the data as big numbers and the front and back yardages can be seen in the display at the bottom. The auto -hole feature makes it convenient for the players to keep a track of your game without having to scroll up and down frequently. The auto feature enables you to be hands-free and not press buttons to record information after every hole that you play. Need to switch off golf mode every time you want to see the time. 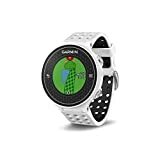 If you are looking for a Golf GPS watch that is fast, delivers accurate distances, sleek, lightweight and ultra-comfortable then look no further. The Callaway GPSy Golf GPS Watch is just the watch you are looking for. All you need to do is charge it fully and then wear it is style and off you can go to play a great game of golf equipped with some great technology. Salient and significant features include quick and easy short distance measurement, easy viewability of time and date, an odometer to keep track of distance and also a scorekeeper function that enables the player to keep arecord of all important data during play. The Callaway GPSy golf watch is particularly useful to wear on cart-path only games or holes where you do not have to search for distance markers or sprinkler heads. the watch will guide you all through. The watch can also be conveniently be worn on the watch only mode when you are not playing and doesn’t have to removed and replaced with another watch. The time and date are already set by satellite-links and the display can be seen in both analog or in the digital format. The watch comes with a rechargeable lithium ion battery that comfortably lasts for up to 10 hours in the GPS mode and approximately up to 90 days in the watch mode. Some customers felt that the GPS took alonger time to get activated and did not catch signals easily. The TomTom Golfer 2 golf GPS Watch is the latest and the currently updated version of the original Tom Golfer golf watch. The most significant and improved features of the updated version include that it is light weight and more sophisticated to look at. It is basically a clean and simple golf GPS watch with not too many frills. It gives you the exact yardage to almost all the hazards you can come across on the course. The watch is equipped with a wonderful feature that is called the ‘hazard view’. The function enables the player to view the yardage available in the front as well as how much yardage is required to clear it. This watch has also been referred to a virtual caddie as it does all the jobs that a caddie would do but in a much more sophisticated way. The large button that is visible on the face of the watch and pokes right through the strap is just a feature that has been added to improve the aesthetic value of the watch. The watch has a rectangular monochrome display which gives just about a decent display of the numbers. Another added feature of this watch is that it lets you review your shot patterns, and even compare holes across various rounds from among any of the 40,000 preloaded courses. The TomTom Golf Golfer 2 is one of the best Golf GPS watches which is acomplete value for money and is one of the most popular product in this category of watches. In this category of golf GPS Watches, the Garmin Vivoactive is a cut above the rest. It is more popular because along with golf this watch can do many other sports as well. The device can track stepsand also can be effectively used for other sports like running, cycling and swimming. The watch can basically be used as a fitness tracker to measure parameters like heart rate, distance, sleep steps and much more. It is really an effective and useful gadget to have as it can double up as a smartwatch and allows phone notifications as well. When it comes to specific golf related functions, the features that users can look forward to are yardage, lay-up distances and of course a huge number and variety of GPS course maps. The watch also looks great and can be worn as a daily accessory. The battery life also is pretty commendable and can last for almost 10 hours in the GPS mode and for more than 3 weeks in the watch mode. When used in sync with the Garmin connect app, the range of possibilities you can explore is a plenty. The Garmin Vivoactive is pretty rugged and another added feature is that it is waterproof. A must have gadget for all those men you are active and always on the go. 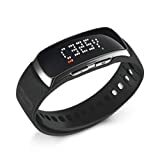 The Golf BuddyBB5 Golf Range Finder Wrist Band GPS Band Watch w/ Pedometer is a sleek watch with an attractive LED display. The display can provide information about your distance from the green as you advance towards the holes and later in between them. Even though the watch has a compact size, this activity tracker is a serious golf accessory which is a popular wearable too. Pre-loaded with almost 38,000 courses across several countries, the watch also has an inbuilt accelerometer that can measure your shots. The Pedometer is a useful feature if you are someone who keeps a track of your daily steps. As with most models this watch to is accompanied with a lithium -ion rechargeable battery and allow the watch to function in the GPS mode for about 10 hours at a stretch and about 20 days in the watch mode. The unique and functional band is supposed to be a new innovation in this series. The watch is stylish, comfortable and functional too, but on the downside loading of the various courses does take a while and the model has not gained much clientele. Loading the data also takes a long time. Buttons on the watch are not easy to use according to some users. The Golfbuddy WT4 GPS Watch has a metallic finish and a design which is quite angular. Though the interface is easy to use, the watch has not gained much popularity. Quickly updating the yardage is a feature which can be mentioned. Other salient features include score-keeping, distance measurement-which includes distance to nearby targets or even hazards, pin placement and much more. The watch is waterproof and features almost 40,000 courses internationally. The watch automatically recognizes holes from all these courses and helps you track your game whichever course you are playing on. Another feature of value is that The GPS tracking features works well for other sports activities too. The design is bulky and not sleek. An absolute show stopper product Garmin Approach S6, Light is a top -notch product, the best in the range that you can find. The geolocation feature is extremely accurate and is the highlight of the watch. The focus on accuracy is much needed to be absolutely sure when you measure thedistance to the hole or green. The device makes everything clear at a glance. With over 40,000 preloaded courses and constant updates, the Garmin S6 light has a fabulous green view. When in sync with the Garmin IQ store, players can use and take advantage of plenty of apps designed specially to enhance the golfing experience. Further, the watch makes use of special motion sensors to measure your shots and strokes and then accordingly provide tips to improve your game. With an efficient battery life that lasts for more than 20 weeks in the watch mode and 10 hours in the GPS mode, almost everything about this watch is a big high, along with the price. The price is really very steep as compared to all the other watches in this range of features. The watch does not have a score card feature. This is one of the latest entries in the Golf GPS watches league. For the price that the watch is selling for the features are loaded with the latest technology and are mighty impressive. The features of the latest entrant are unmatched and can be easily identified as the best in this category of watches. To further add to its also impressive features the Garmin S60 has a long and healthy battery life which lasts for more than 10 hours in the GPS mode and 10 days in the smart watch mode. Accompanied by a rechargeable lithium-ion battery, this watch is by far the best product you can ever ask for. Several additional features to help you improve your game. Needs support of your smart phone to get access to more apps. The SkyCaddieLinx GT is a wonderful watch that would definitely be the pride of its owner. This watch was specially designed for the stylish golfer. Though it is a bit more expensive as compared to its counterparts, the watch does not have as many features that prove its worth. This could be one of the reasons the watch did not go down well with the golfer fraternity.Limited features and functionality and only single color (black) availability could be the other reasons. The upside of the watch includes features like its ability to measure shots using the GPS. Further, it has the ability to analyze each swing accurately and then offers the player tip on how to improve too. Other than for golf, the watch can also be used for tracking your calories, calculating steps and measuring distance too. Measuring Potential: A good golf GPS watch should give accurate measurements of distances to center, back, and front of the course. Not only that they should be able to record this data carefully to show you at a later stage and further help improve your game. Course availability: Though most watches are preloaded with approx. 40,000 more or fewer courses in their units. These are the more well-known and famous courses that you will find in pre- loaded set. If you are playing on a local course in your neighborhood, the course may not be available on that list. If you want your course also to be mapped you will need to get in touch with the manufacturer who will do it by charging a substantial subscription fee. Size: Since these are wearables size and weight do matter a lot for convenient and easy wearing. Too big and bulky watches which are also heavy may get in the way of the player’s swing and ruin his style of play completely. So, choosing a watch with the right dimensions is a very important factor that cannot be ignored. Battery Life: Watches with poor battery life can be a real disaster. It is as good as not having a watch at all. There is no point in having a watch with a drained-out battery on the golf course. Neither will you be able to record any data, nor do a comparative study of your game. Salient Features: The more the features the better it is. Instead of depending on several devices to record, store and tutor you, it is better to have a single gadget to perform all the functions. But at the same time, too many unnecessary features can really end up irritating you and too few features will not give you the desired data that you need to improve your game. User – friendly: Unless the product is user-friendly the player will not enjoy using it and he might just decide t continue playing the way he used to before he acquired the gadget. A gadget that is always having complaints like slow loading of data, lack of basic features, complex navigation techniques etc all put off the user, thus resulting in poor reviews and even poorer sales. Style, Design, and Appearance: Today every wearable object has to be sophisticated as well as durable to get the attention that it truly needs. 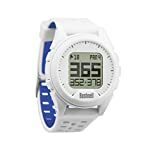 Good looks coupled with great functionality is the ideal combination you should be looking for when you are on the hunt for the perfect Golf GPS watch. Endurance and Performance: This aspect of the watch can be best described by people who have actually used the product and are still using it. Seasoned players who have a long-term association with the game and related products that enter the market, can be the best critics of such products. Unless and until the product has an excellent performance history along with the other features discussed above there is absolutely no need to buy this product in a hurry. Cost: Last but not the least, this is one of the most important factors that must be considered before taking the final plunge. The watch must have all the required features that are going to prove that the product that you are going to invest in is acomplete value for money. Striking the right balance between features and cost is what that is going to matter in the long run.